Not quite sure I follow what the problem is here... that the camera won't see the top of the wall when zoomed in too far? Could you maybe post some stills or even a video clip from the camera to illustrate the problem? I leave the numbers to the brainiacs and just ask you: do you ONLY need to see the top of the wall and .5 meters over it? My brother Web works at the local hoosegow, excuse me correctional institution, where they done flipped a ptz upside down so it looks like a mini-observatory. Its full time tour is to scan the walls from about halfway up to top looking for scramblers. Though at 1.5m I don't know if that'd work in your case unless its a jail for toddlers. Anyway, it might then angle too high over the top for the same reason, but I'd thought I'd throw it out there. So as to give you the extra angle up you need. It sounds like maybe your camera doesn't have a full 90degrees (or 180 degrees, depending how you look at it) of tilt. Actually, in looking at the specs, that is exactly the problem, it only tilts from 10° - 170°. 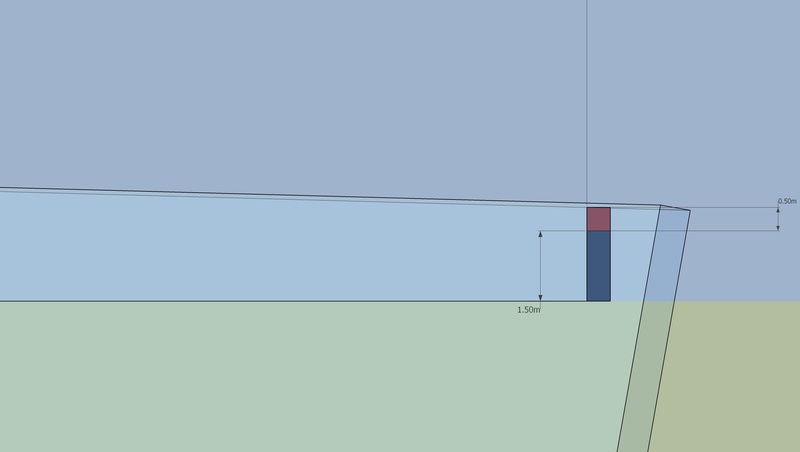 Using some basic trig, you want to see the top of the wall, where the camera is going to need to be mounted above the wall so that its 10 degree look-down angle doesn't force you to look at the ground. You need to be roughly 1.5M (the height of the wall) plus .176 meters high for every 1 meter of distance between the camera and the wall. EG: If you mount the camera 50M from the wall you would mount the camera 1.5+(50*.176) meters high, or 10.3meters high. I used the triangle calculator on this page as a reference: http://www.cleavebooks.co.uk/scol/calrtri.htm Put in 10 for Angle A, and your distance for edge b, and hit calculate. Take the result it gives you for edge a and add 1.5 meters. 1. How far is the wall from the camera? 2. Do you need to see over the wall or just to the top? 3. Is the lens actually 4M high from the ground? 4. Is it possible to just raise the mast (or use a different pole) temporarily to find the right height? I did a quick sketch up showing what your problem is - as "A" notes, the camera itself doesn't tilt all the way up to 90 degrees from vertical; most PTZs of this type (at least, most of the ones I've dealt with) will only go up far enough to you get a bit of the housing in the top of the frame when zoomed all the way out, which in your case means it stops at about 80 degrees from vertical. So as A says, to see over the wall, the camera needs to be somewhat higher than the wall. Keep in mind that you still won't see very much over the wall - the higher you go with the camera, the less the wall will block your view. 2. It is a problem that has evaded an exact solution. 3. I had no intention of modifying Undisclosed A's formula to take into account lens angle. The formula needed to be changed because, as it was left, it would require a pole 40M(!) high. Your calculations are wrong. He wants to see the top of the wall at 22x zoom. The camera spec page says that at full 22x zoom, the vertical fov is 3.4 degrees. Or, 1.7 degrees above/below center axis. I did calcs to put the center of the FOV at the top of the wall, the lens will show you +1.7 degrees above the wall (so that you can see what is on the wall and not just the very top of it). Mounting the camera 7.5 meters high means it's 6 meters above the the top of the wall, 200M away. That would mean the camera lens would need to have a 1.7 degree minimum downtilt angle, when it really has 10 degrees. I'm not sure if you arrived at calculations that get to an angle of 1.7 degrees by coincindence, or if you were trying to take the lens FOV into account. Because we are dealing with such a narrow FOV, I ignored it and just calculated for center of FOV, this gives you a little bit of "slop", since these measurements might not all be perfectly precise. For a 200M distance you need to mount the camera 35.3 meters + 1.5 meters above ground. If you mount the camera 50M from the wall you would mount the camera 1.5+(50*.176) meters high, or 10.3 meters high. In any case at least we don't have to split hairs, there quite a disparity;). Let's just go with the assumption that you are correct and maybe you can show me where I ran aground, no pun intended. First off do you notice any numbers that I am showing in the axis parameters screen that are clearly in error? One that looks suspicious is that "Level FoV = 0 ", i'll take a look at it. I was under the impression that one could calculate fov angle from focal length and sensor size format, is that not true? My first estimate used 50M camera-to-wall distance as an example. I didn't know the camera was 200M away at that time. My formula works the same with 200M, but of course yields a higher required mounting height. Good news: You're calculation is right! 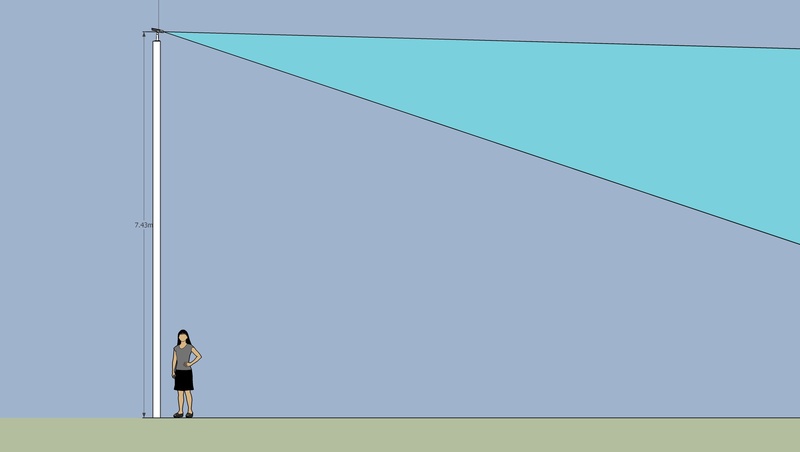 So sketchup now says a 30m camera height will cover 2m from the ground. The vertical FoV is 3.4. 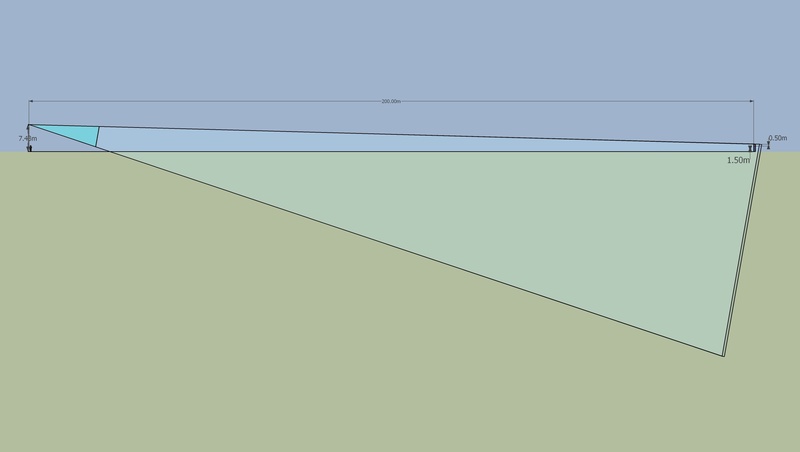 My problem was thinking that by inputting the focal length and resolution it would calc the fov. But of course resolution is not the same as sensor size and for generic cameras at least there is no way to specify sensor size. So you have to enter in fov angles as well as focal length to get it to work. 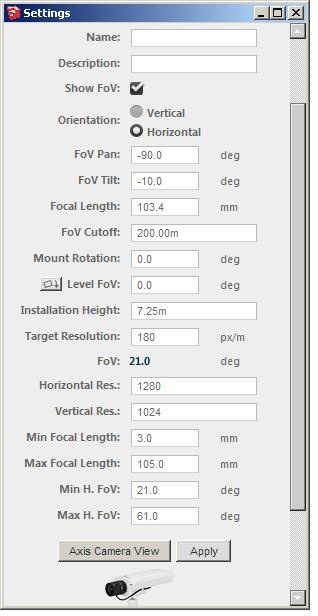 Also the axis tool only allows entry of H fov not V fov, I'm assuming that it calcs v fov by using the resolution ratio. Maybe the 5m difference is the lens FOV/slop? Three cheers for Undisclosed A!